AMARILLO, Texas — OK, I’m just kidding about that suggestion to name the tower after Sod Poodles. I mention it because of an announcement today that Amarillo’s tallest structure is slated to carry the name of another bank. Chase left the ground floor of the 31-story tower and today it was announced that FirstBank Southwest is moving into Chase Bank’s first-floor office space. The building known formerly as the Chase Tower will become the FirstBank Southwest Tower. My question: For how long? I’m not real crazy about corporations purchasing building-naming rights. What occasionally happens is what occurred when Chase left the tower. The building name came off the top of the skyscraper. Yet we still refer to the structure informally as the “Chase Tower.” Just mention the name and everyone in Amarillo knows what you’re talking about. At least, though, the new bank is a locally owned outfit. I suppose that makes it more tolerable than some big corporate name being plastered on the side of what is among the city’s most recognizable downtown structures. They’re going to name the city’s new minor-league baseball team later this year. I’ve already stated my case for Sod Poodles, which is among the five finalist names under consideration by the team owners. My own preference for what it’s worth — and it’s not much these days, given that my wife and I now live elsewhere — would be to put a name more linked to the region than to some corporate entity. Palo Duro Tower. Llano Estacado Tower. High Plains Tower. Canadian River Tower. Caprock Tower. Local media perhaps ought to rethink the way they are reporting this bit of news. Chase Bank is leaving the ground floor of the 31-story office tower that carries the bank’s name. The bank is moving to a new location along Interstate 40. 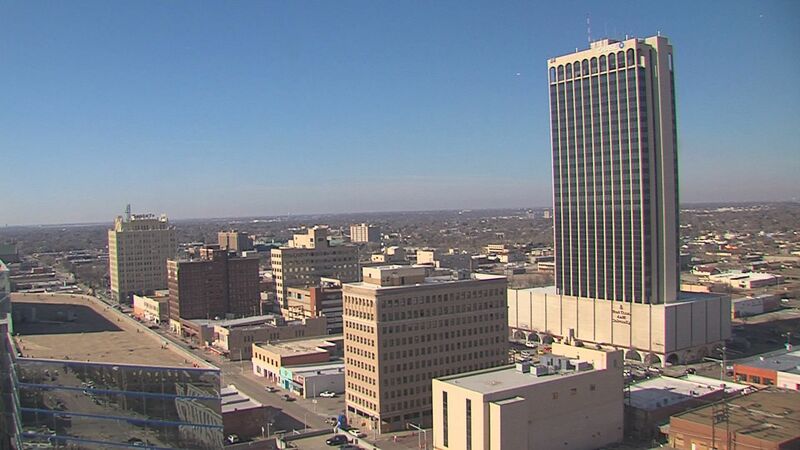 But despite reports by some in the Panhandle media, the Amarillo “skyline” isn’t changing. The tower will have a new name. Or it might not have any name at all, at least for the time being. But the Chase Tower — I’ll call it that for now — keeps getting darker. Xcel Energy vacated the building in 2017. West Texas A&M University’s downtown Amarillo center is moving soon into what used to be called the Commerce Building on Eighth Avenue and Tyler Street. I’ve lost count of the number of Chase Tower floors that have gone dark — or are about to go dark. Let’s just say it’s, um, quite a few of them. 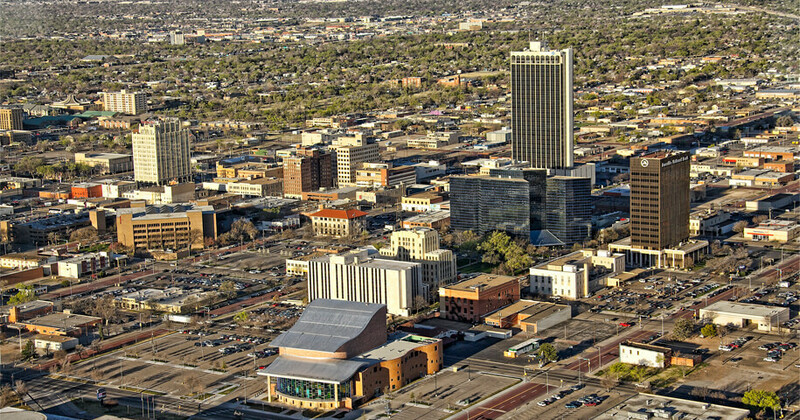 For some time I have been proud to extol the progress that has occurred in downtown Amarillo. The ballpark will be opening for baseball and other activities in April 2019; the city welcomed a new top-drawer hotel across the street from City Hall; Xcel Energy moved into a new office building in 2017; Polk Street is being revived, rejuvenated and renovated all along its corridor between 10th and Sixth avenues. That’s all good news, yes? Of course it is! The Chase Tower, though, will need a new name when the bank vacates the ground floor in early March. What do we call it? How about, oh, the Amarillo Tower? As for the search for new tenants, I’ve been told by a principal with Gaut Whittenberg Emerson commercial real estate brokers that they remain highly optimistic they’ll fill the space that’s been made empty. A truly crappy year is moving into its final week. Americans have elected a seriously deficient individual as president of the United States; we lost a lot of iconic celebrities in the arts, sports, pop culture and politics. I’m going to hope for the best as it regards the new president and, of course, I can’t do a thing about those we lost. Here at home, Amarillo is in the midst of a serious municipal makeover. Since we’re heading into down the stretch of a tumultuous year, I don’t believe it’s too early to offer a wish or two for 2017 for the city I’ve called home for the past 22 years. They’ve knocked down a Coca-Cola warehouse and distribution center downtown. They’ve relocated it at a new business park on the north side of the city. What happens next to the now-vacant site depends on what happens in San Antonio and whether our local government authorities can negotiate a good deal for the downtown business and entertainment district. The old Coke site is slated to become home for a ballpark. Its cost now sits at about $45 million. It is supposed to be the home field for a Class AA minor-league baseball franchise currently plays hardball in San Antonio. 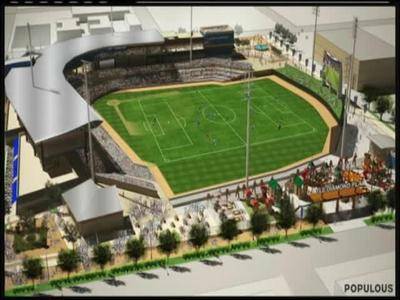 That team’s owners want to bring the Missions to Amarillo. However, San Antonio has to lure a Class AAA team to fill the void. If the Alamo City can’t consummate that deal, then the Missions won’t leave. At least that’s my understanding. Meanwhile, the Amarillo Local Government Corporation, which the City Council has tasked with negotiating the deal to bring the Missions here, says it needs a signed agreement before it will agree to start construction on the multipurpose event venue at the former Coke site. My hope is that the city can bring the Missions here; that it can start work on the MPEV; that all the other construction projects now underway — the Embassy Suites Hotel and the parking garage — get completed; that retail outlets lease space in the parking garage. The Chase Tower is going to see a lot of floors go dark in 2017. Xcel Energy is moving into a new office complex on Buchanan Street and will leave the Chase Tower. And … West Texas A&M University also will vacate the Tower by 2018 when it opens a new downtown campus at the totally made-over structure formerly known as the Commerce Building. A partner in the Gaut Wittenberg Emerson commercial real estate firm has given me rock-solid assurance that the Chase Tower vacancies will be filled. We’ll be watching, man. Polk Street is witnessing a serious construction boom at the moment. New restaurants and bistros are being built. 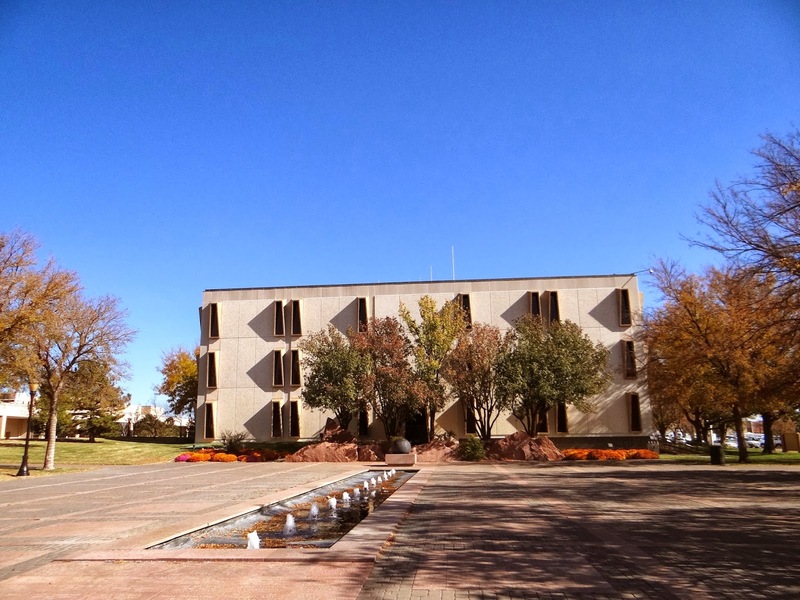 The city has just been awarded a Cultural District designation by Texas Arts Commission with the hope of boosting interest in the arts and cultural amenities offered in Amarillo. The city is undergoing in the midst of a serious makeover. We’ll have an election in 2017 that could be as dramatic and consequential as the 2015 municipal election that brought us three new City Council members. Oh, and the council is now poring over the qualifications of five competent individuals seeking to become the next city manager. You want change? It’s here folks. My hope for the city is that we steer it in the right direction. The Chase Tower looms 31 stories over the city and from that top floor one can get a breathtaking view of our spacious landscape. When you look east from that tower, though, you don’t have to cast your gaze toward the horizon to see the sure sign of change that’s occurring. Look down just a bit at the Civic Center, City Hall, at the Globe-News Center for the Performing Arts and you see some serious work being done. You’ll see two vacant lots that have been cleared out. Look a bit south of those two lots and you’ll notice a new structure rising up from the dirt; that would be the new Southwestern Public Service office complex. The two lots? They’ll belong to the Embassy Suites convention hotel and a parking garage. Site preparation has begun on those two sites. I have the privilege of looking at all that change each week when I attend the regular Rotary Club of Amarillo meetings at the Amarillo Club atop the Chase Tower. I do enjoy seeing the change from week to week that’s occurring on the sites. The SPS building seems just a tiny bit closer to completion; the convention hotel site and the parking garage lot are getting prepped to a little greater degree. To be candid, I remain a bit surprised that so much work has been done on these downtown improvement projects. After the tumult associated with this past spring’s municipal election that brought us three new City Council members who didn’t seem as dedicated to the project as their predecessors, I feared the worst. I feared that the work would come to a halt. The multipurpose event venue appears to be inching toward its start; the downtown convention hotel and the parking garage are about to take some form. Amarillo’s downtown business district is going to reap the benefit of the change that’s coming its way. As the center of the city improves, you can take my word for it: So will the rest of Amarillo. Yes, the view from the top floor of the Chase Tower looks mighty grand. There used to be a time when I ventured into downtown Amarillo daily. I worked there full time. I would see the same sights as I drove toward my place of employment. When you see the same things each day you don’t always notice changes while they’re occurring. These days I get downtown far less frequently. It’s usually once per week to attend a Rotary Club meeting at the Chase Tower. Those downtown sojourns, though, are producing a visual treat for me. I’m noticing the changes more readily. I cannot say I notice them week over week, but I do sense some serious changes — for the better — in our downtown district. The most obvious change has been the sight of that construction crane over a major project going up on Buchanan Street. It’s the new Xcel Energy office complex. They’ve laid the foundation and have begun framing the multi-story structure. Xcel will move into the building in 2017. As I drive down Polk Street, I get the sense of more activity on what used to be the city’s “main drag.” It’s nothing I can define point by point. It’s just a feeling in my gut. The last time I saw Potter County Judge Nancy Tanner, I told her how proud I am of the courthouse complex renovation. She’s clearly proud of it, too. And she should be. The Commerce Building at Eighth and Tyler is going to be transformed into an urban branch campus for West Texas A&M University. And, of course, we have this multipurpose event venue that’s now planned for construction at the site of the vacated Coca-Cola distribution complex across the street from City Hall. I’ve long believed that any city’s future depends on the health of its downtown district. Show me a city with a dilapidated downtown and I’ll show you a city in serious decline. Believe me, I’ve seen my share as I’ve traveled through Texas over the past 31 years. I’ve also seen cities with vibrant downtown districts that also reflect the health of their communities. My hope for Amarillo is that the momentum I sense is increasing in its downtown district will continue and pick up speed. That Xcel Energy construction crane is a huge start. I’m ready to see more of them. Are we going to be timid about city’s future? Leaps of faith require a certain degree of risk. We take them at various stages of our life. When we change careers; when we move from one part of the country to another; there’s even a leap of faith that occurs when you commit yourself to someone for the rest of your life. The great thing about faith, though, is that if it’s strong enough, it can carry you through. You rely totally on it. So it might be with Amarillo City Hall’s grand new plan for its downtown district. It might well require us to take a leap of faith that a new direction for the city is worth the effort. I’m still dumbstruck by the timidity I keep hearing from those who for whatever reason — real or imagined — feel somewhat intimidated by what’s being proposed for the downtown district’s future. Planners want to build an athletic/entertainment venue. They want to construct a downtown convention hotel. They are planning to build a parking structure. Three building are going to be built downtown. The aim is as plain as it gets: They want to reshape downtown. They want it to become something of an entertainment attraction. What is it now? Well, it’s really more or less … how do I say it nicely, nothing to brag about. At least not yet. It’s come some distance from where it was, say, 20 years ago. The Santa Fe Building is bustling with Potter County government activity; Polk Street is slowly coming back to life; that big ol’ Chase Tower is full — for the time being — but it will lose a lot of tenants when Xcel Energy and West Texas A&M University vacate the tower for new digs elsewhere. Xcel’s and WT’s departure from the Chase Tower, therefore, isn’t a net loss for the downtown district. It’s a net plus. There’s movement, finally, on the Barfield Building at the corner of Sixth and Polk. The leap of faith will occur when the multipurpose event venue is built and the city starts to promote it for a wide range of activity. It will rely on hotel-motel tax revenue to keep it going. The convention hotel is tied directly to the MPEV. It, too, will require some serious marketing and promotion. It’s time to keep the faith, man. I am acutely aware of the need to improve the Civic Center. That, too, will come eventually, at least that’s my hope. And what about the old Herring Hotel building on the northern edge of the downtown district? Believe it or not, downtown leaders tell me they believe there is a place for the Herring, that it can be renovated and turned into something not yet envisioned or imagined. It, too, requires a leap of faith. I am willing to take that leap. My faith in the potential for success makes it possible. Still wondering: How does downtown plan hurt? Let’s take the long view, shall we? 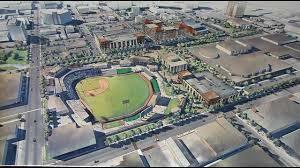 The drawing here depicts what Amarillo’s downtown district is set to look like in about, oh, five years. It shows a nifty little ballpark directly across the street from City Hall. To the west of the ballpark we’ll have a convention hotel. Next to City Hall there’ll be a covered parking garage. City officials think all of this is doable. They believe that once the project is complete, the city will draw additional convention business, with flocks of convention-goers putting themselves up in lodging downtown and perhaps as well along Interstate 40. Xcel Energy has broken ground on a new office complex it will occupy once it vacates the 31-story Chase Tower. City and downtown development officials are planning a daylong session Wednesday to lay out the project in detail. They’ve invited the public to take part. They want to hear everyone’s concerns; they’ll certainly accept supporting comments. They also say they intend to listen to the concerns of those who are opposed — some of them adamantly — to the downtown project. What on God’s Earth, though, can be wrong with redeveloping a downtown district that once flourished as a gathering place for Panhandle residents, but which has languished over many years as a place that remains a business and financial center, but needs some energy? The City Council and economic development leaders have told us until they’ve run out of breath that the downtown redevelopment will occur without spending additional property tax money. They contend that hotel/motel taxes will pay for it. The money will come from those who visit Amarillo, from folks who live elsewhere. And even that has drawn criticism. The projects are moving forward. Agreements have been signed. They’re finally starting to bust up some pavement to make room for what promises to be a grand new look for our downtown business district. The price tag is around $100 million. Development leaders are securing private investors to foot a huge part of the bill. Has that quieted the critics? Oh, no. They’ve persisted in the demagoguery. I need to ask: Are we going to forsake this investment in our city’s future because some of us just cannot believe it’s possible in little ol’ Amarillo, Texas? How about stretching our reach just a little bit to grasp what — to my eyes — looks quite promising? The news about downtown Amarillo hasn’t been good of late, what with the master developer hired by the city vaporizing into thin air in the span of a 24-hour day. Xcel Energy announced plans to build a $42 million office building, which is the first large-scale office construction project in more than three decades. Yes. But there’s a catch. 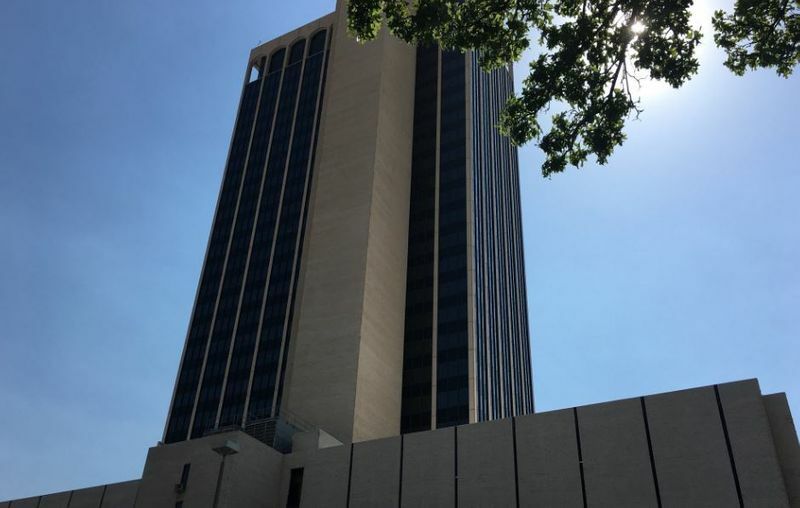 Xcel is going to vacate the several floors it occupies at the Chase Tower, that huge 31-story skyscraper that juts out of the downtown Amarillo skyline. I ran into my old pal Wes Reeves recently at the coffee shop on the ground floor of the Chase Tower. He made some cheeky remark about the appearance of the new structure. Actually, it looks attractive — at least to my eyes. It’ll comprise four stories and 114,000 square feet at Seventh and Buchanan. Three floors of office space will sit atop a parking garage that will hold at least 500 vehicles. Xcel plans to move in by the spring of 2017. I’m glad to see the activity picking up downtown. What about the floors that will be vacated at the Chase Tower? Developers there have done a great deal to improve the appearance of that skyscraper. It’s a bustling hub of activity now. However, West Texas A&M University is moving its Amarillo campus operation of out there eventually to a new site where the Commerce Building sits. The exit of WT and now Xcel will vacate about a dozen floors of the Chase building. That’s an unacceptable level of darkness in a building that towers so tall over our city. Someone once told me that if Amarillo had been chosen as the home for what was known as West Texas Normal School, what is now West Texas A&M University today would be the size of Texas Tech University. WT would enroll 30,000-plus students rather than just a shade less than 8,000 who attend school’s Canyon campus. Still, the news that WT is purchasing the Commerce Building in downtown Amarillo and relocating its downtown operations from the Chase Tower to a new campus setting is good news for the school and, I hope, for the development of the downtown business district. WT is getting some foundation grant help as well as financial aid from the Amarillo Economic Development Corporation to make the move. Most interesting of all is that WT’s downtown Amarillo operation enrollment has far exceeded what the school had projected when it opened in the Chase Tower. The student enrollment is about 75 percent greater than expected, with more than 1,000 students attending classes in three floors of the 31-story office tower. WT’s century-old presence in Canyon, of course, is well-established. Think, though, of the possibilities if the downtown Amarillo campus takes off. Might there be incentive to grow the Amarillo campus even more? It’s heartening as well to see the relationship between West Texas A&M and Amarillo begin to blossom. There hasn’t always been that kind of warmth. Both the city and the university will reap yet untold rewards if they continue to build on it. Is it me or is the air getting dirtier? My memory is pretty good on a number of levels. I remember phone numbers, physical addresses, people’s names (most of the time) and usually trivial numbers, such as family members’ Social Security numbers, my wife’s driver’s license number and, of course, my U.S. Army service ID number issued to me in August 1968. I also am able to remember weather conditions over the long term. Today’s latest wind/dirt storm that blew in over Amarillo reminded me of something: I do not remember in my more than 19 years living in the Texas Panhandle a spring that was so windy, dusty and downright unpleasant. Am I imagining this or is it for real? I’ll plead for help on this one. Today was the third significant wind/dirt storm in the past three or four weeks. I was having lunch today on the 31st floor of the Chase Tower in downtown Amarillo when I looked out the window and saw the brown cloud rolling in. I looked away and then peeked back out the window a moment or two later; the view of the city was hidden by the dirt cloud. My memory isn’t of the steel-trap variety, but it seems to be reliable almost all the time. I just don’t remember springs quite like this one. We’ve lived here since early 1995 and we’ve seen all kinds of weather: 20-inch snow deposit in a 24-hour span, 111-degree heat in the summer, frog-strangling downpours, sleet, heavy wind … you name it. Is the climate changing on the High Plains, as it is reportedly doing in so many other parts of the world? OK, I won’t get into the cause of it here. Suffice to say that, to my eyes, it seems as if we’re windier than usual. We’re darn sure dustier than usual, which no doubt is the result of that crippling drought from which we have yet to emerge. A lot more moisture would dampen the dirt enough to prevent it from flying in the wind. Enough of the wind … and the dirt. OK?